Breakfast is the one meal that I always struggle with. I am horrible about grabbing a cup of coffee in the morning and then nothing else until the middle of the afternoon. After getting sick with pneumonia last winter I have changed my breakfast routine and attempt to eat breakfast every morning. Granted it's still a struggle. Some days I do great and others I glance up and it's 2 pm and all I've eaten is a brownie. Not so great. My two boys on the other are great breakfast eaters. They love pancakes, waffles and anything breakfast related. The only problem I have with them is that they get bored easily. If given the choice they would eat only sugar in the morning, pop-tarts, cookies you name it. I on the other hand want them to eat at least a little bit healthy, so I try to find a compromise. This week I tried a new recipe for Eggnog Pancakes from the December issue of Better Homes and Gardens magazine, which looked perfect for my family's breakfast needs. This recipe has 7 ingredients. It takes 20 minutes of prep, 4 minutes of cooking per patch and makes 16 pancakes. I did make a few changes to the recipe since I eat gluten free. Instead of all-purpose flour I used gluten free all-purpose flour. The gluten free all-purpose flour that I use has coconut flour as the main flour and is great for cooking and baking. I love eggnog, but I hate all the fat, so I used low-fat eggnog which only has 3 grams of fat per cup. For the cooking I used a griddle, which I love for making pancakes. A griddle makes all the difference for getting golden beautiful pancakes. I followed the remainder of the recipe as written. My two boys really loved this recipe. The pancakes baked up beautiful and neither of my kids noticed that I made them gluten free. I served their servings with butter and my serving with pure maple syrup. They were great either way and would be just as great with wheat flour. A great breakfast option for the holiday season. For the recipe go to Gluten Free Eggnog Pancakes. These look excellent! I am going to make these Christmas morning. Thank you so much for sharing! Thanks :) Tell me how they turn out! That looks so good! I love eggnog and pancakes, so this is a good mix! I came over from the Aloha Affair, glad I did, cause those look amazing! I love eggnog and pancakes also, so this is a great fit :) Going over to check out your blog now! What the what?! Eggnog pancakes?! My husband would kill someone on the street for these! They really are good, my whole family loved them! I have quite a few family members that are gluten free. I bet they would LOVE these. I'll be sure to pass them on. I love egg nog too so these are a win win for everyone. I found your blog through the Aloha Friday Blog Hop. I have a number of family members that can't eat gluten also :) And I agree, I love eggnog! Going over to check out your blog! 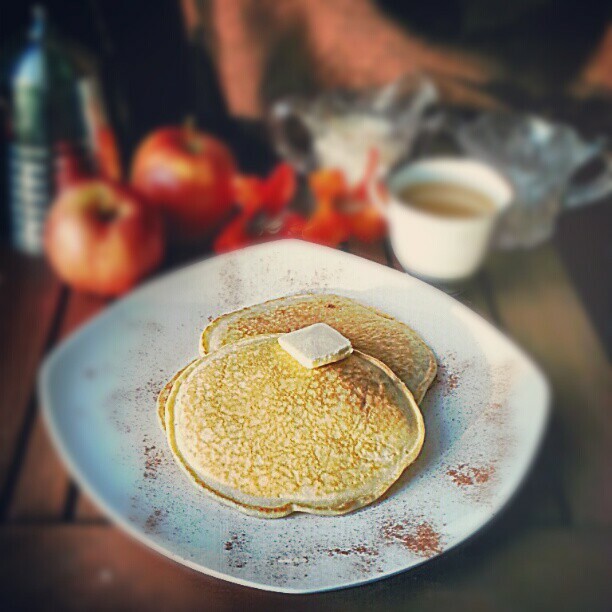 Eggnog pancakes... yummy!! Yay you! I am your newest follower and was hoping that you would follow me back! They really were yummy :) Followed you back!